Tudor recorders are one of the best values on the market for classroom or home instruments. Quality construction, accurate intonation, and an easy 1 piece model, makes this recorder an excellent choice for your students. 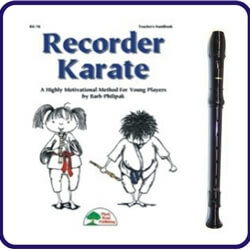 Recorder Karate is a highly motivational method for young players by Barb Philipak. This method motivates students with dimple rewards for each progressively more difficult tune.